Imagine being able to control every system and appliance in your home remotely--in much the same way you channel surf. That's the promise of Security & Automation. The technology has been around for decades, but new advances have renewed interest in ways to control not only Security but entertainment, lighting, appliances, heating, cooling, and more. Life is hectic and keeping up with all the systems in your enviroment is challenging to say the least. AAC can automate most of those systems - relieving some of your daily stress and worries. Security alarm, lighting, thermostats,entertainment systems and more can easily be automated - saving you time money and stress! AAC's Alarm System can integrate them into one simple App. Modern day security alarm systems have the ability to multi-task. They not only protect but can control lighting, thermostats and many other things. Imagine that you left the light on in the kitchen. The alarm systems motion sensor hasn't detected any motion for 15 minutes so the security alarm system turns the light off. One of my favorite automation tasks occurrs when I get up in the middle of the knight and raid the frigerator. I hit the hallway, the motion sensor detects me and turns the light on to a dim level of 30 percent. Not bright enough to blind me but, enough to light the way. Then, 6 minutes later, it turns it off. 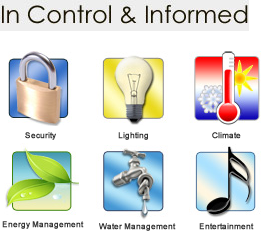 Provide energy savings and convenience with lighting control. Consider the security and safety benefits of integrating lighting control with your security system. This allows you to schedule lighting based on any security system function - sensor detection, system arm/disarm state, time of day, light/dark outside, and more. Never again arrive at a dark building, automaticly turn unused lights off. Go on vacation and schedule lighting for different times of day and night. Alarm systems can turn off the main water supply in the event of a leak and/or when the system is armed away. This is especially helpful when the premise is unoccupied for extended periods, as in the case of vacation homes, school systems closed for long vacations, etc. Turning on water is just as useful for sprinklers, pools, hot tubs etc. Offer substantial energy savings with integrating with communicating thermostats to provide control, based on schedule or occupancy, without sacrificing comfort. systems can also control air ducts to reduce airflow to normally unoccupied rooms. Provide full control of the audio and video system from our easy to use color touchscreens, cells or internet connected device. Your favorite song, playlist, or station can be automatically played when you disarm the security alarm system or wake up to start the day. The system can also mute the audio system when the telephone or doorbell rings. You set the sean and the automation takes care of the rest! In addition to lighting and climate control, Alarm systems can control electric water heaters, electronic shades/blinds and other electric devices to provide even more energy savings Just turning items off when not used can save 30% ! That can provide return on investment. Alaska Automation Center 1-907-562-4700 simple, yet innovative products that have now become industry standards.